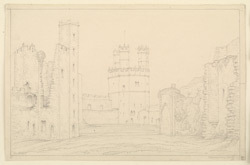 Drawing of the enclosure of Caernarfon Castle in Gwnedd in Wales. This view is of the lower ward of the castle from the upper ward. The large polygonal tower with three turrets is the Eagle Tower, which was the first tower to be completed in the complex. Caernarfon Castle was situated on the Menai Strait between Anglesey and north Wales. Edward I commissioned the building of a castle at Caernarfon in 1283. He had earlier seized the town, expelling all the Welsh inhabitants, in order to establish there his seat of government in Wales. The castle was constructed under celebrated castle mason James of St George at fast speed because of the constant danger of attack, but was never finished. Severe damage was done to the castle in a Welsh revolt in 1294-5. Although not as brilliant defensively as Harlech and Beaumaris Castles, it was a very sophisticated fortress and a potent symbol of Edwards's royal power in Wales.